Bright beautiful vegetables! ...and Steve can't spell. In less than a week we will be enjoying the sun, food, wine, culture, and everything else Spain has to offer. It will be our first visit to Spain and our second trip to Europe and we can’t wait. It has been an extremely foggy summer in San Francisco’s Sunset District and we are in dire need of some rays. Madrid, Barcelona, Valencia, and San Sebastian spread over 15 days. In preparation, Jason has been taking a beginning immersion Spanish class at Casa Hispana. Though his Spanish language skills are in their developmental stage, he’ll be doing a much better job with communicating than he did on last year’s trip to Paris. His French speaking skills were so pathetic that even the baristas at Starbucks couldn’t understand his simple request for coffee. Cafe con leche is our typical morning brew so we’ll at least get started on the right foot when we land in Madrid. 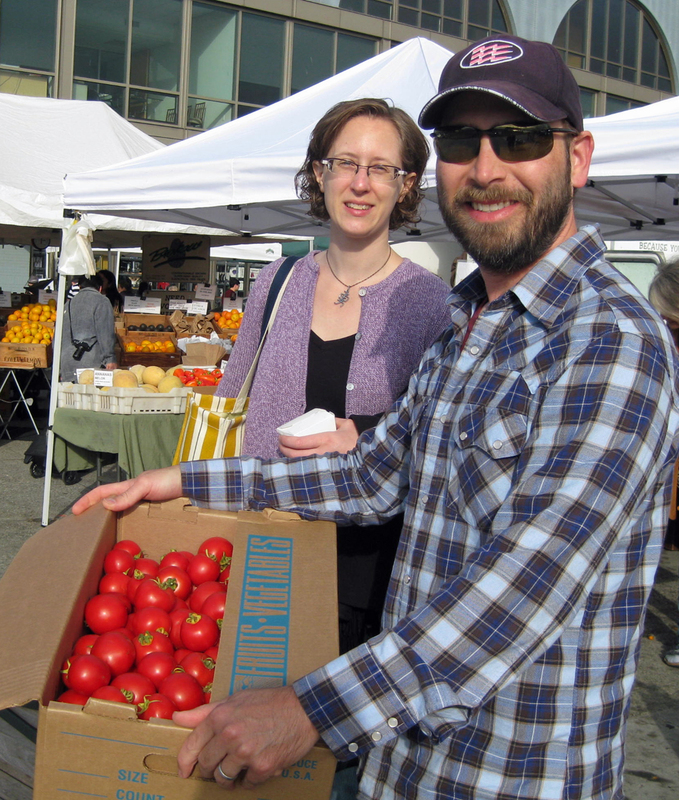 Susan and Jason at the Ferry Building's Farmers Market on Saturday morning. Thanks for all the help, Susan. 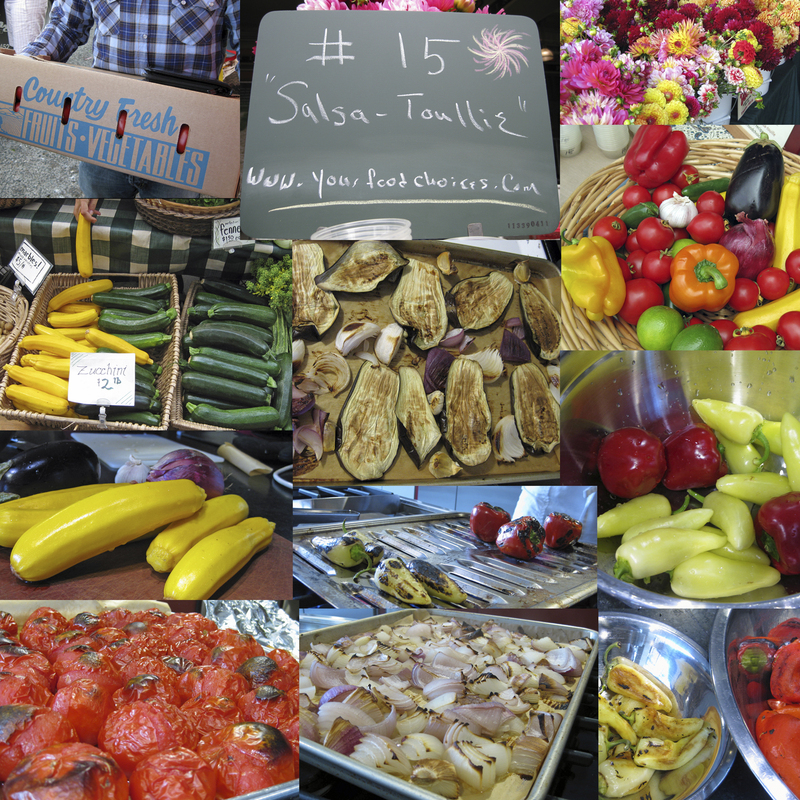 For the last ten years or so, Jason has been making a ratatouille (French) or pisto (Spanish), which is basically a summer veggie stew, that seems to get better and better with each batch. Neither one of us is a big fan of zucchini, summer squash, or eggplant, but when they are roasted and then stewed with onions, tomatoes, roasted peppers, garlic, thyme and lots and lots of olive oil it becomes the best thing in the world to eat. This year, with thoughts of Spain ever on our mind, an idea was hatched to combine the best that pisto has to offer with the spiciness of Mexican salsa. As far as we know, there is not a salsa or other dish that combines all the vegetables mentioned above with the spicy peppers of Mexico. We imagine it must be because of a feud centuries ago that forbade adding squash or zucchini to salsa. We’re probably completely wrong, but since we’re gringos who are essentially biologically mutts we figure we can add just about anything to our salsa without upsetting any familial laws. We describe it as Old World meets New World salsa or, in this particular case, a salsa-touille. We hope you try our recipe and let us know what you think. Preheat the oven to 450 degrees. Line two sheet pans with parchment paper. Place eggplant, squash, onions, tomatoes, and garlic on the two baking sheets. Roast in the oven for about 20 minutes, rotate and roast for another 10-20 minutes or until slightly -medium toasted. At the 20 minute mark the garlic may be toasted enough to come out of the oven. Remove from the oven and set aside to cool. If you have a gas-burning stove you can roast the jalapeños and bell peppers on the stovetop over the open flames of the burners. If you cook with an electric stove, roast the peppers under the broiler, turning regularly until completely charred. Once the peppers are charred, wrap them in one or two paper towels and cover the wrapped peppers with a bowl for 5-10 minutes. Take off the bowl and gently wipe off the charred skins . Do not rinse under water. It’s OK, if there is a little charred skin left on the peppers. Cut off the tops of the peppers and discard the seeds and ribs for a more mild salsa. Include the seeds and ribs for one with more heat. Once all the vegetables are cool, rough chop or tear apart with your hands and add them to a food processor with the chipotle pepper. Pulse 3 – 4 times then add salt and lime (or vinegar). Process for approximately 10-20 seconds or until an even , slightly chunky consistency is achieved. We just love discovering new foods. The greatest thing to hit our local farmers markets this summer, or at least that’s new to us, is the Padrón pepper. Steve first tasted them at Bocadillos where they were served pintxos-style, cooked whole in a little olive oil until the skins blistered then lightly salted. He was hooked from the first bite. Padróns have a unique flavor marked by an unusual meatiness and just a hint of bitter. They (usually) pack no heat in the tiny seed cluster that nestles next to the stem. But every once in a while, you get a hot one that reminds you that you’re eating peppers. The heat dissipates quickly. It’s spicy like cinnamon, not like a hot chili pepper, so there’s no risk that the capsaicin sensitive will be bowled over by these delicious nibbles. 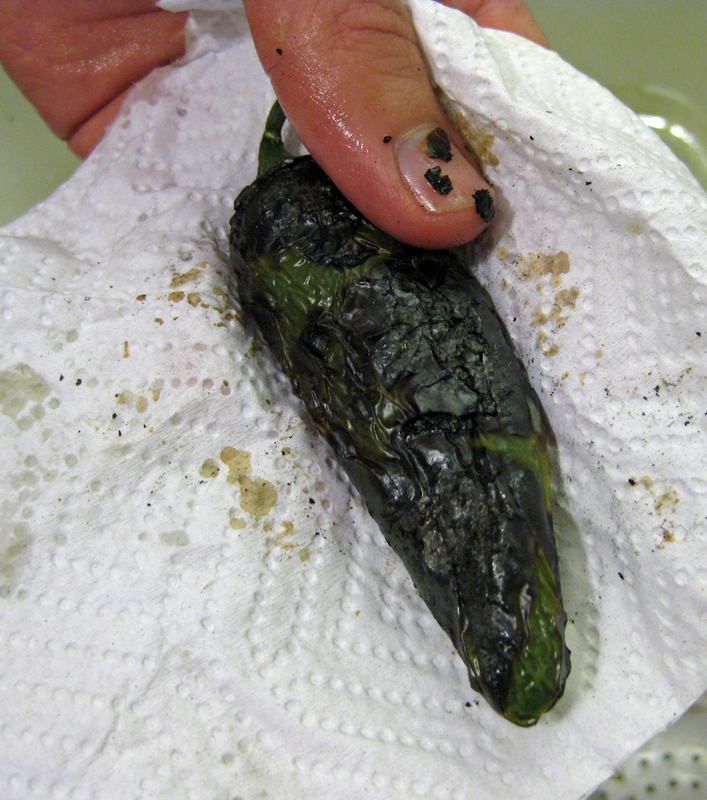 The dark green peppers are picked when bite-sized making them a perfect finger food. And like other salty finger foods, they’re hard to push away from after only a couple of bites. We’ve eaten entire pints in a single sitting. But unlike potato chips or roasted nuts, we just can’t feel guilty about feasting on them. These Spanish delicacies are, in fact, a New World food that made its way back to Europe a few hundred years ago. Popularized by Jose Andres, and other Spanish chefs, the pepper variety is enjoying its 15 minutes of fame and as such is now readily available throughout the summer at a growing number of farmers markets across the country. Peter Piper may have picked a peck of pickled peppers, but we sautéed the Padrón peppers with olive oil and a sprinkle of salt. Which is much easier to say and do. Even though we are late to this pepper’s fan parade, we want to give a big shout out to them for anyone who will listen. 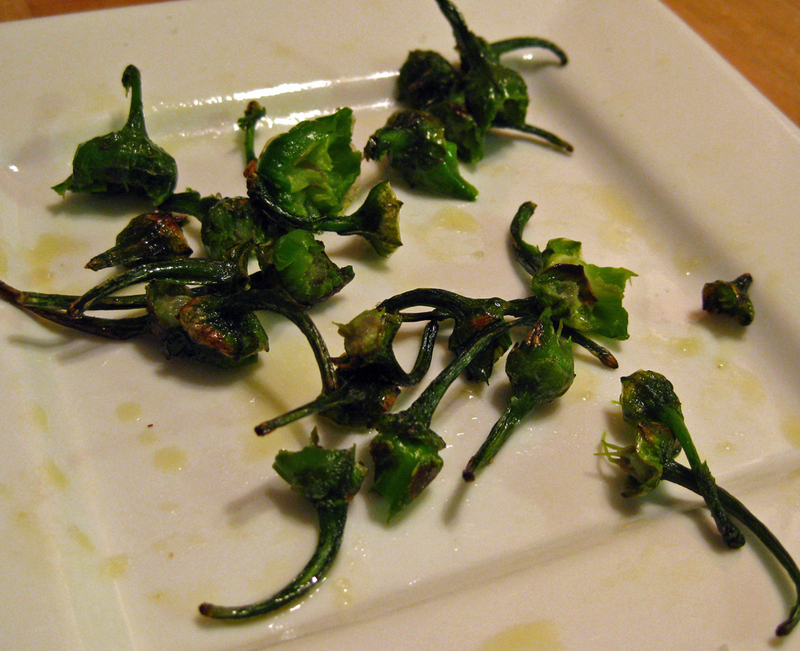 Now go out and find some Padrón peppers and give them a try! Wash peppers under running cold water until well rinsed, drain. Heat olive oil in sauté pan until just shimmering. Add peppers and cook on medium high heat, turning frequently, until skins blister on all sides. Remove from heat, drain on paper towels and plate, sprinkling with the sea salt. Eat warm or at room temperature.